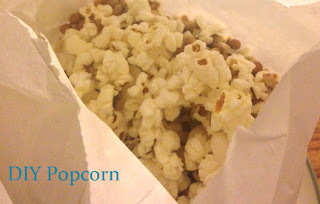 I mixed the popcorn kernels in a bowl with the oil, then I poured them into a paper bag. I folded the top of the bag down twice so that I didn't have a microwave full of popcorn. I also placed the bag on a plate so that it didn't make the plate greasy. I learned some important things about doing this. First, a half of cup and 1 tsp of oil would work better at a time. It was too much popcorn to fit into one bag. If you need more, make another batch in another bag. Second, you don't actually need butter. A little bit of salt makes it taste quite buttery. I'm not sure why but I'm sure the canola oil plays a role. Third, my kids loved it. It went great with their first viewing of The Rescuers. Last, I bet you could make this about 20 bags of popcorn for the price of one box of microwave popcorn.